empower you to achieve your optimum potential. Garnered through years of real world, hands on business expertise, the concepts addressed by Blaise Brosnan, in this book, will encourage you to think differently and make smarter decisions for your life and your business. Following the simple strategies in outlined in this book will ultimately set you free of your own limiting beliefs, get you out of your own way and allow you to release your previously limiting expectations for yourself and unleash your highest potential. The result? Achieving your version of success and wealth, both on a personal and a business/career level. necessary tools to unlock your own capacity and achieve greater business success – and will no longer be the limiting factor! Provides a practical, hands-on approach to better business management. Enhanced with numerous case studies drawn from the author’s own practical experiences of working with over 2,000 SME companies over a 23 year period. Contains a number of templates to facilitate the reader in recording and monitoring their progress. Guides the reader through a manageable and attainable ‘changing process’ towards improving their businesses output. “Managing your career has always been important but I believe it is even more essential in today’s very uncertain world. 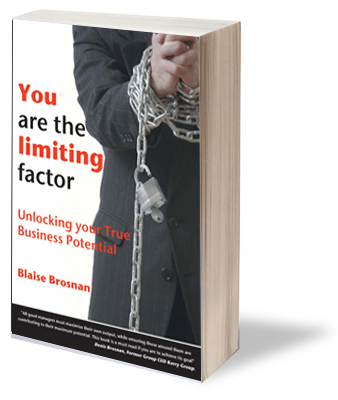 Blaise Brosnan’s “You are the Limiting Factor” gives very practical advice in helping you develop your career by both challenging and guiding you on your career path. This book could help you reach your optimum potential in business”. Philip Lynch, CEO, One Fifty One plc. “This is one of the most practical books on business skills that you are likely to come across – buy it, more importantly use it”.